I review bags for Macworld, but I’m also the brains behind the TED gift bag, which means that I’m becoming quite a bag savant. So believe me when I say that a truly unisex bag is difficult to find. And an even rarer gem is a unisex-style bag that’s actually attractive. Happy Owl Studio’s $249 Briefcase for MacBook Air meets both criteria—it’s streamlined and efficient with dashing good looks. This is not to say that my high rating of the bag is based solely on its superficial virtues. While the deep-brown leather exterior and subtle embellishments (such as the leather strap closures and colorfully patterned interior lining) are impressive, the usability of this bag is what ultimately won its spot as my go-to work tote. 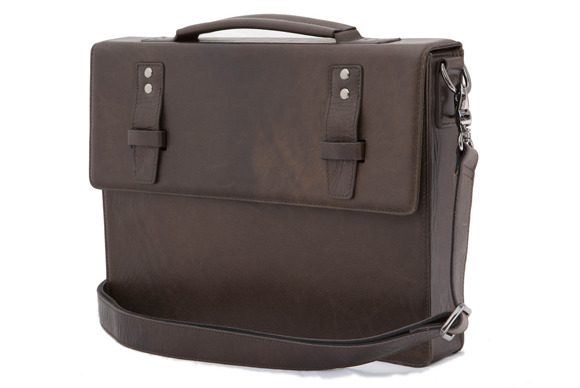 The comfortable shoulder strap and handle make it a breeze to carry around, and its structured frame provides protection for a laptop without the bulk of excessive padding. The Briefcase’s interior (measuring 14.3 inches wide, 11 inches deep, and 2.3 across) reflects this sleek, streamlined design. There’s a lightly padded sleeve for a computer, a flat back pocket for papers or an iPad, and a business card holder, pen compartments, and cable loops for small-item storage. As its name suggests, the Briefcase is intended for the 13-inch MacBook Air, but I my 13-inch MacBook fit snugly inside, as well. My lone criticism of the Briefcase is that its leather closure straps don’t weave seamlessly through the the loops on the front of the bag. While this doesn’t affect the bag’s ability to stay shut—a magnetic snap does a fine job of keeping your things in place—it does take away from the aesthetic of the bag. Those with a tendency towards the neat and buttoned-up might be bothered by a strap that doesn’t go where it ought to. Overall, though Happy Owl Studio’s design caught my eye, it’s seeing this bag in action that placed it at the top of my favorite-bag list. Stephanie Kent is a former Macworld intern who lives and writes in New York City, where she works for TED.